As the impacts of anthropogenic activities increase in both magnitude and extent, biodiversity is coming under increasing pressure. Scientists and policy makers are frequently hampered by a lack of information on biological systems, particularly information relating to long-term trends. Such information is crucial to developing an understanding as to how biodiversity may respond to global environmental change. Knowledge gaps make it very difficult to develop effective policies and legislation to reduce and reverse biodiversity loss. 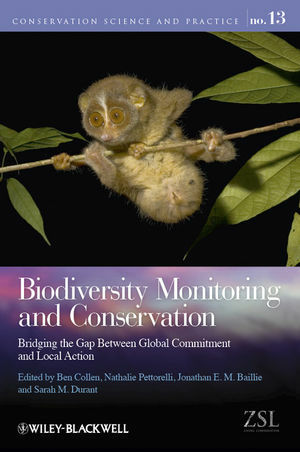 This book explores the gap between global commitments to biodiversity conservation, and local action to track biodiversity change and implement conservation action. High profile international political commitments to improve biodiversity conservation, such as the targets set by the Convention on Biological Diversity, require innovative and rapid responses from both science and policy. This multi-disciplinary perspective highlights barriers to conservation and offers novel solutions to evaluating trends in biodiversity at multiple scales. Ben Collen is head of the Indicators & Assessments Unit at the Zoological Society of London. His research is focussed on developing indicators to monitor change in biodiversity and help guide policy responses to conservation problems. He conducts local scale monitoring on tropical forest fauna in Liberia, and penguins in the Antarctic. Nathalie Pettorelli is a population ecologist, whose research is centred on predicting the impacts of global environmental change on biodiversity. Her work was among the first to explore the usefulness of satellite data (in particular, the Normalised Difference Vegetation Index) in the context of population ecology and dynamics. Jonathan Baillie is Director of Conservation at the Zoological Society of London. He is responsible for conservation projects focusing on threatened species and habitats in over 50 countries around the world. His research focus lies in defining the status and trends of the world's species and ecosystems. Sarah Durant is head of the Tanzania Carnivore Centre in Arusha, and the Range Wide Conservation Initiative for Cheetah and Wild Dog. She has been working for over 20 years in carnivore conservation in Africa, focussing on developing effective and sustainable approaches to conserve threatened species.